The Lockheed F-104 Starfighter is a single-engine, high-performance supersonic interceptor aircraft, originally developed for the United States Air Force. The 104 was a response to American pilots who were concerned that the Russian MiG-15 was superior to their aircraft, and that a small and simple aircraft with excellent performance was required. The F-104 Starfighter featured a radical wing design. 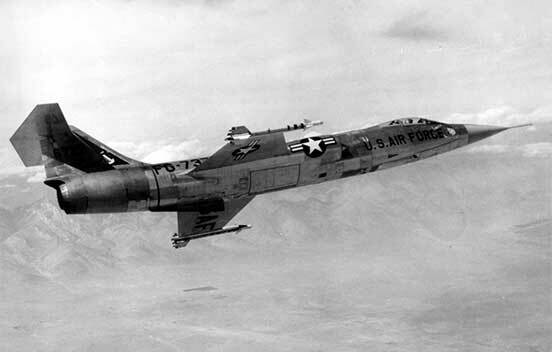 Most jet fighters of the period used a swept-wing or delta-wing platform to ensure balanced overall performance. The 104 Starfighter’s wings were very small, thin, straight, and mid-mounted for supersonic flight. The new wing design’s leading edges were so thin (0.41mm) and sharp that they presented a hazard to ground crews, and protective guards had to be installed during ground operations. The thinness of the wings also required fuel tanks and landing gear to be placed in the fuselage. Early F-104 Starfighters used a downward-firing ejection seat out of concern over the ability of an upward-firing seat to clear the T-tail empennage at high speeds. This presented obvious problems in low-altitude escapes, and 21 USAF pilots failed to escape their aircraft in low-altitude ejections because of it. Later models were fitted with an upward-firing seat capable of clearing the tail. The F-104A Starfighter served for the USAF from 1958 until 1969, and continued with Air National Guard units until it was phased out in 1975. 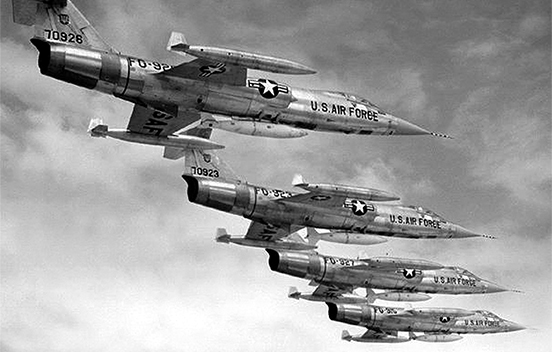 A total of 2,578 F-104s were produced by Lockheed and under license by various foreign manufacturers.